PORTLAND, OR--(Marketwired - Apr 17, 2014) - Marriott International, Inc. is pleased to announce that Residence Inn Portland Downtown/Pearl District just opened on April 11, 2014, making it the first Pearl District hotel. As a thriving, revitalized area of the inner city, the Pearl District is internationally recognized for its successful urban renewal efforts. Residence Inn Portland Downtown/Pearl District is located at 1150 NW Ninth Ave., providing comfortable, modern accommodations and convenient access to the Pearl District's numerous offerings, ideal for business or leisure travelers. The six-story, 223-suite hotel offers a variety of layouts that include a studio, and one- and two-bedroom suites. All rooms feature separate living and sleeping areas plus fully equipped kitchens that have a refrigerator, microwave and coffeemaker. Floor-to-ceiling windows present views of the vibrant Pearl District, Downtown Portland, the Cascade Mountains and the Willamette River. The hotel provides complimentary high-speed internet access, grocery delivery services, a manager's reception on Monday and Wednesday evenings, and free local and USA Today newspapers to make guests feel at home, no matter the length of their stay. While being an extended stay Portland hotel, the Residence Inn Portland Downtown/Pearl District also features 4,100 square feet of meeting space, inclusive of 2,010-square-foot and 425-square-foot ballrooms and 1,600 square feet of pre-function space. The sustainable building, which aspires to LEED Silver Certification, boasts a 1,600-square-foot courtyard with a fire pit as well as an indoor pool, fitness center, guest laundry facilities and a business library. A full-service bar welcomes the Pearl District community along with hotel guests, and a 24-hour market accompanies the complimentary hot breakfast buffet served daily. The Pearl District occupies land on the western banks of the Willamette River with a history tied to the railroads and industrialization of the early 1900s. More recently, it has become a trendy area booming with dozens of breweries and other eateries, community parks, and culturally stimulating art galleries and theaters. Residential enclaves and corporate offices have also contributed to the Pearl District's renaissance. The five-block Brewery Blocks shopping center, iconic Powell's City of Books and Jamison Square are must-see sites in the Pearl District. "The Pearl District has become a highly desirable destination within the city of Portland," said Aung Win, General Manager of the Residence Inn Portland Downtown/Pearl District. "Marriott is proud to be the first to bring hospitality to this flourishing area and to contribute to the Pearl District's continuing growth." To celebrate its opening, Residence Inn Portland Downtown/Pearl District has made a special offer available for new bookings. Receive 2,500 Marriott Rewards bonus points per stay when you stay anytime through July 2014. Rates start at $139 per night. For more information about the Residence Inn Portland Downtown/Pearl District or to book your stay, call 503-220-1339 or visit www.ResidenceInnPortlandPearl.com. With more than 650 all-suite properties in the United States, Canada, Europe, the Middle East and Central America, Residence Inn by Marriott is the leader in the extended-stay lodging segment. Designed for long stays, the brand offers spacious suites with separate living and sleeping areas. Fully functional kitchens, grocery delivery, 24-hour markets and complimentary breakfast help guests maintain a healthy balance while on the road. Complimentary Wi-Fi allows guests to stay connected to the home and office, while health and fitness options and inviting lobby spaces provide comfortable places to work and relax. Residence Inn participates in the company's award-winning Marriott Rewards® frequent travel program that allows members to earn hotel points or airline miles for every dollar spent during each stay. For more information or reservations, contact the Residence Inn Portland Downtown/Pearl District directly at 503-220-1339, call the Residence Inn toll-free number at 800-331-3131 or visit www.residenceinn.com. For travel tips, the latest on the brand or to connect with other travelers, "like" Residence Inn on Facebook: www.facebook.com/residenceinn and follow Residence Inn on Twitter: www.twitter.com/residenceinn. Marriott International, Inc. (NASDAQ: MAR) is a leading lodging company based in Bethesda, Maryland, USA, with more than 3,800 properties in 72 countries and territories and reported revenues of nearly $12 billion in fiscal year 2012. The company operates and franchises hotels and licenses vacation ownership resorts under 18 brands. For more information or reservations, please visit our website at www.marriott.com, and for the latest company news, visit www.marriottnewscenter.com. 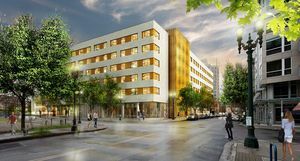 Marriott International, Inc. is pleased to announce that Residence Inn Portland Downtown/Pearl District just opened on April 11, 2014, making it the first Pearl District hotel. Check out our downtown Portland Hotel deals!